End mills come in different sizes and with different numbers of flutes. In addition, they can be made of different materials. End mills are used with our CNC router or CNC mill. The material you want to cut dictates the proper mill material and number of flutes. If you are unsure which end mill to use, please refer to our collection of milling experiences. End mills are usually "bring your own" as there are way too many different types and quality levels out there. However, for soft materials and at your own risk there is a simple set of cheap end mills available to share in the CNC room (if they haven't broken down yet). 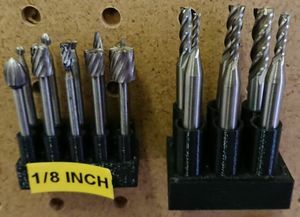 Make: "The Skinny on End Mills"